There is always the daunting feeling walking into a Shakespeare adaptation that you'll never be able to keep up with the story due to the language being fired off by actors rather than being able to personally read it and evaluate the dialogue in your own time. 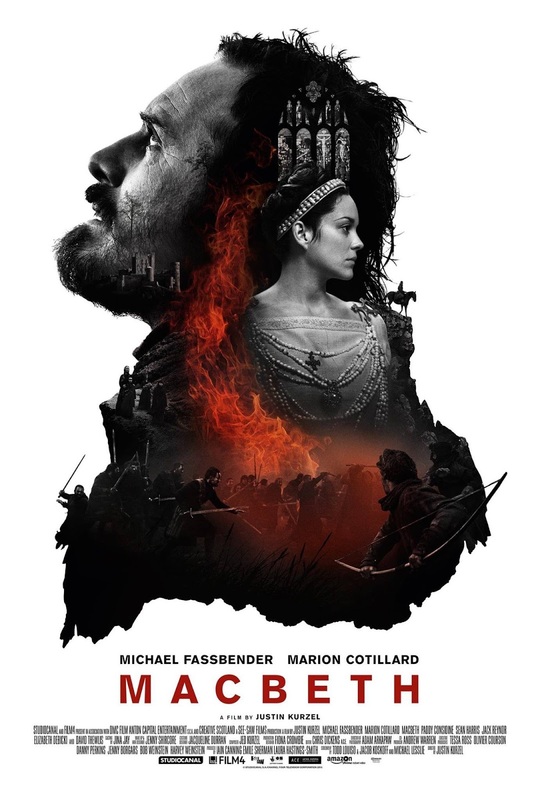 The same is true with director Justin Kurzel's (next year's Assassin's Creed) Macbeth for, while I was familiar with the story having read the play in high school, I couldn't remember every detail and I certainly wasn't familiar enough with the language to understand everything as would be necessary after only a single viewing. And so, the idea of watching the film, much less writing about it felt incredibly daunting. After attempting to strip my mind of everything but the cinematic experience I was about to embark on I immersed myself in the Scottish lore of the titular Thane as he was submerged into this hugely stylistic world that Kurzel would use to convey the complicated language of the play. It is in the imagery that Kurzel's interpretation excels and where it sets itself apart. Where it falters is in the changing of a few major aspects from the source material. Overall, this particular adaptation comes out a winner given it has the ability to connect with modern audiences through its expansive and dark visual prowess while briskly delivering the main ideas of Shakespeare's play. 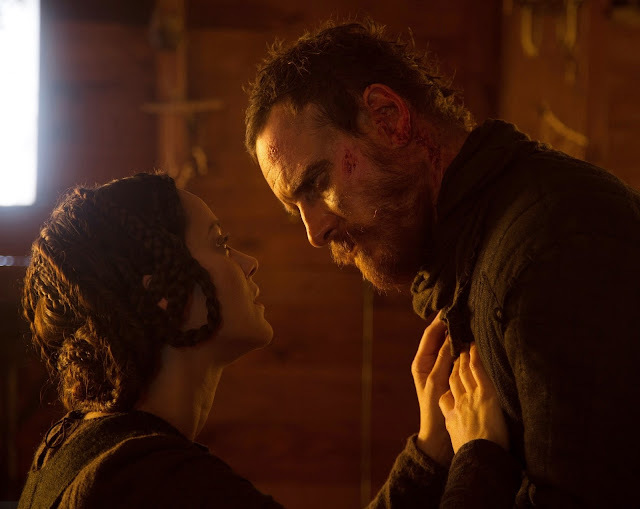 It doesn't hurt that Kurzel has recruited the talent of actors like Michael Fassbender and Marion Cotillard to convey such material to modern audiences as each contain enough gravitas in their stares alone to guarantee the audience pays attention. It is not in any of these individual facets that Kurzel's film fails to engage the audience, but simply in the amalgamation of so many experimental factors that they override the bare bones brutality of the story and all that it intends to say. I enjoy how much Kurzel uses his exceptional visual ability to convey the necessary story beats, but by more or less having screenwriters Jacob Koskoff, Michael Lesslie, and Todd Louiso compact the narrative into a less than two hour experience some of what the imagery suggests is lost in the lack development. If you recall your high school English classes you might recall that in Macbeth there are three witches that foretell of Macbeth's (Fassbender) rise to be the King of Scotland while at the same time prophesying that future kings will descend from Banquo (Paddy Considine), a fellow army captain. After being prodded by his ambitious wife, Lady Macbeth (Cotillard), Macbeth himself murders King Duncan (David Thewlis) by stabbing him countless times and then passing his blood onto the hands of the members of the King's chamber. Macbeth also threatens Duncan's son, Malcolm (Jack Reynor), with the suspicion of his father's murder and so he flees. Shortly after becoming king, Macbeth sends mercenaries to kill Banquo and his sons so that what has been foretold may fail. Of course, such attempts to defy these visions will only come back to bite the overly-ambitious Macbeth and his ruthless wife and yet they can't help themselves. It is not in the ascension to power that the story takes off though, but more in the guilt and horror that both the titular character and his wife begin experiencing in the wake of this new-found power. Forever fearing that the witch's prophecy will come true Macbeth continues to perform unspeakable acts in hopes of ensuring his future as the King of Scotland, but the end is unavoidable and with the return of one of Duncan's most loyal followers, Macduff (Sean Harris), Macbeth once again sees that his fate has always been sealed. Lady Macbeth (Marion Cotillard) and Macbeth himself (Michael Fassbender) ponder their plot to reign supreme. By saying that some of the original plays intended themes and ideas are lost in the translation of Kurzel's visual storytelling is to say that while this version more or less understands what it needs to do in order to tell the story capably there is nothing about it that makes the need feel warranted. Sure, the slow motion battle scenes are gorgeously (and bloodily) rendered and both Fassbender and Cotillard are worthy actors of the material, but as the film continued to play and I began to warm to the idea that I was catching the gist of what was attempting to be accomplished I wasn't necessarily engulfed as one would expect to be when it comes to material from someone who is widely regarded as the greatest writer in the English language. At this point it is all about interpretation though, and where the script lacks is in reducing one of the most famous female characters in all of literature to little more than the third or fourth most important character in the piece. Lady Macbeth, with Cotillard's ability to play her no less, is given only a single ruthless speech with none of the unshakable guilt or vivid hallucinations that depict blood on her hands as she sleepwalks through the castle all of which made the original character so iconic. There are glimpses of the ambition and ruthlessness that have made the character unforgettable, but Kurzel's film tends to focus on the slowly decaying mind of the titular character rather than that of his corrected conscious as personified through his wife. The scene in which Macbeth sees the recently murdered Banquo at a celebratory banquet gives the audience insight into just how much strain Macbeth is under, but that Lady Macbeth is only present here to re-direct this disillusionment into strength makes the character feel much more sympathetic than I recall her being in the play. Where Macbeth is hindered is where I imagine many a screen adaptations of Shakespeare's works tend to be hindered and that is in the source material simply being too expansive to reduce to a two-hour piece of pop entertainment. The more desirable format would seemingly be that of a miniseries, but given what we have here is a 113-minute feature there simply isn't enough time or space for a storyteller to flesh out the characters and the scope in which Shakespeare operated and without as much, the depth is not felt. Kurzel clearly wants to pay the necessary dues to Shakespeare's work, especially in his lush and suggestive visuals, but that we're never truly able to get in tune with the material in a way that elicits an emotional reaction renders the majority of this film ineffective. There is much to like, a lot to look at, but not much to feel and therein lies the difficult task of making this material both supremely influential and compelling when it's a story that has been told so many times before. There are glimmers of great possibility that never exactly come to fruition, but certainly more than enough to give good reason to look out for Kurzel and Fassbender's next collaboration.